- One full day fishing for Atlantic salmon on main Southwest Miramichi River in a private fishing pool known to be productive. Includes day fishing license, transportation to and from fishing, guide service and three full-course home cooked meals. Non-fishing persons welcome. Two nights excellent accommodations over looking beautiful Miramichi River One full day fishing for Atlantic salmon on main Southwest Miramichi River in a private fishing pool known to be productive. Includes day fishing license, transportation to and from fishing and guide service. - Fridge, stove, microwave, toaster, etc. 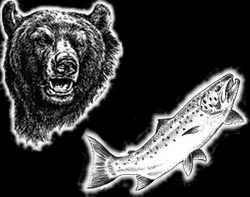 - One day fishing for Atlantic salmon on main Southwest Miramichi River in a private fishing pool known to be productive. Includes day fishing license, transportation to and from fishing, guide service and noon lunch. Non-fishing persons welcome. Five hour guided tour in the back woods of Miramichi area. Bring your camera and venture into the unknown wilderness. Observe wildlife and enjoy the beauty of nature. Who knows what you might see. Possibly a large bull moose, a female moose with her calf, a whitetail deer or maybe a black bear. Includes transportation in a tour vehicle, refreshments and lunch at a fully equipped hunting lodge. Groups of five or more persons preferred. Note: Most sportspersons prefer to use their own fishing equipment but if you are a first time client, or you have forgotten your equipment, all the necessary items will be available free of charge to enjoy a great fishing adventure.